The first post on this blog briefly described the range of archaeological sites that are located on and around Slievemore Mountain on Achill Island. Having set the archaeological scene it seems like a good time to take a brief look at the geology and ecology of Slievemore. Slievemore is one of a series of notable mountains that form a very important part of the landscape of the west and north west coastal region of County Mayo, a group that includes the well-known pilgrimage Mountain of Croagh Patrick near Westport, Knockmore on Clare Island, and Nephin Beg near Ballycroy. This part of County Mayo is a mixture of low lying coastal plains, inland bogs and rolling hills separated by large steep-sided and highly visible mountains. As you move around the area these distinctive summits form a familiar backdrop, recognisable landmarks that allow you to identify your relative position on the ground. Whilst the low lying plains and bogs can be a little lacking in distinguishing features, each of these prominent hills has a very particular character making them instantly recognisable whenever they come into view. 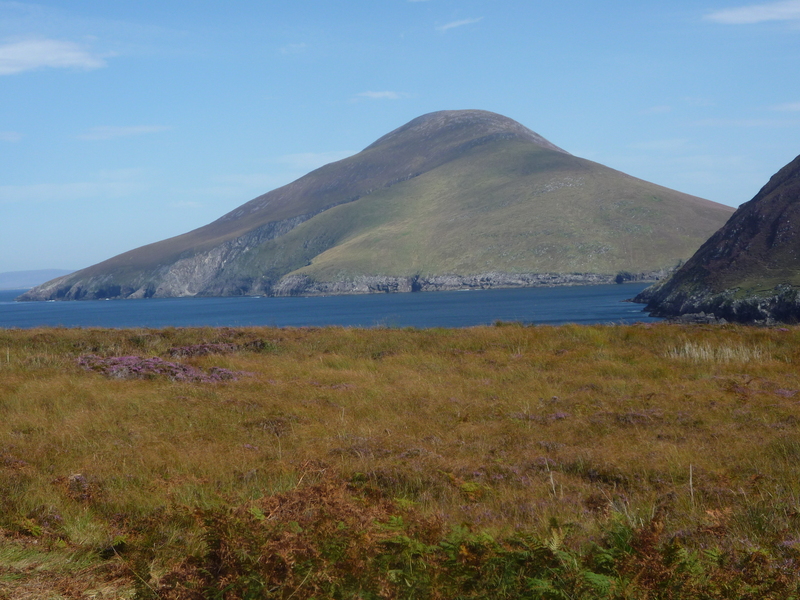 Slievemore is the second highest mountain on Achill at 671m OD and dominates the western half of the island. The mountain is very much a discrete entity, with low valleys at the east and west separating it from the adjacent lower ridges, whilst on the northern side it plunges steeply down into the Atlantic Ocean. To the south there is a low-lying bog that stretches out to the coast at Keel and which contains the large fresh water lake, Keel Lake. Slievemore has reasonably gentle lower slopes stretching up to around the 250m contours. Above this height the ground become considerably steeper and is dominated by large scree slopes. At the north east, just behind the village of Dugort there is a substantial glacial corrie that provides a view that is stunningly beautiful and frankly rather intimidating. Along the northern side of the mountain there are low but steep cliffs that drop into the Atlantic and numerous deep inlets that have been cut into the mountain by strong wave action. Above the scree slopes there is a wide ridge that slopes up from the west towards the summit. The ridge is covered by exposed boulders, broken up and eroded peat formations and shallow pools of crystal clear water. As the summit is approached the ridge becomes increasingly narrow and the summit area itself is very small and flanked by very steep drops to the north and south. Views from the summit are quite magnificent, with huge areas of Mayo visible to the north, east and south and the expanse of the Atlantic Ocean visible to the west beyond Croaghaun Mountain and Achill Head. A small circular cairn and a trigonometry point mark the summit. The geology of the mountain comprises quartzite and schist that descend towards the lower contours close to the Deserted Village. There are frequent veins of milky white quartz running through the mountain and a massive quartz boulder, known, as ‘The Star’ lies high up on the southern side where it is very visible landmark on most days of the year. Overlying the bedrock is a deep layer of grainy sandy till that contains frequent small boulders and pieces of the white milky quartz. Today the till is covered by an expanse of Atlantic Blanket Bog, the depth of which varies considerably from one location to another. This peat bed consists of the partially decayed remains of bog plants such as sphagnum moss, ling heather and purple moor grass. Waterlogging and the acidic ground conditions halt the normal process of bacterial decay and the partially decayed plant remains form deep accumulations of dark brown and black peat. Despite the steepness of the ground Slievemore provides an extensive area of grazing today for reasonably low numbers of sheep, but in the past it is likely that far larger flocks of sheep have been grazed on the mountain, alongside cattle and goats. At several of the excavation sites examined by Achill Archaeological Field School a pre-peat soil has been revealed directly overlying the till and underlying the peat bed. This pre-peat soil, grey sandy silt, demonstrates that prior to the onset of bog growth the mountain would have been covered in lush pasture. In the centre of Slievemore Roundhouse 1 a post abandonment soil was discovered that had become waterlogged preserving thousands upon thousands of individual blades of grass, a discovery that was particularly evocative of this earlier environment. The steady accumulation of peat on the mountain has provided ideal conditions for the preservation of the remains of stone buildings, which are enveloped by protective layers of peat following their abandonment. The Middle Bronze Age roundhouses that were excavated on Slievemore between 2006 and 2009 are among the best-preserved and most intact structures of that period known from Ireland. The Early Medieval Kiln complex excavated between 2010 and 2011 was an equally impressive discovery and to date no clear parallels for such a substantial set of industrial buildings from this early period have been identified to date. No doubt future work on Slievemore by Achill Archaeological Field School will continue to reveal more examples of these hidden architectural gems. Whilst the archaeology of Slievemore has been the focus of the majority of the work of Achill Archaeological Field School there are a number of other locations where the field school has undertaken important research. 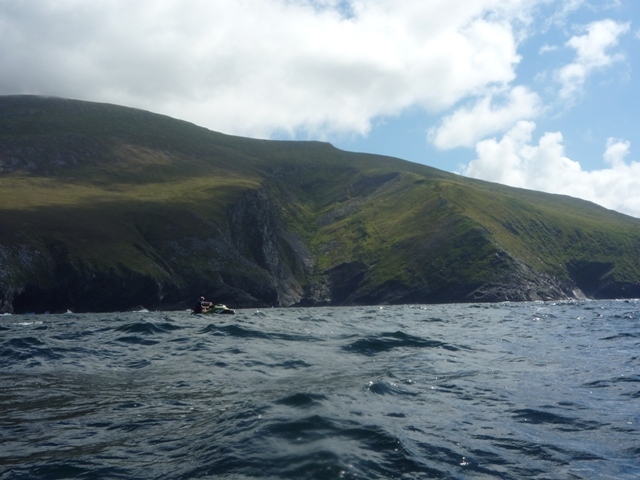 The next post on this blog will take a look at one of the areas of the island that is a perennial favourite with the students; Keem Bay, Croaghaun Mountain and Achill Head. 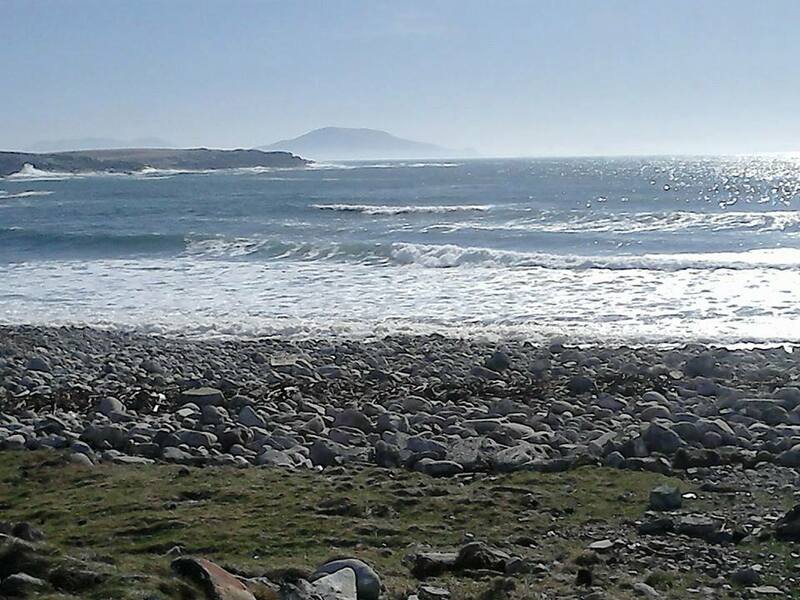 Achill Archaeological Field School runs a variety of archaeological courses that are suitable for archaeology and anthropology students, professional archaeologists and inquisitive members of the public. Visit our website at http://www.achill-fieldschool.com for details of all of our courses and information about the many exciting projects we have undertaken. Residential and non-residential options are available throughout the summer. We also specialise in Guided archaeological tours of Achill and the Corraun Peninsula. ← Welcome to our Blog! The most recent Ordnance Survey map has Croaghaun’s altitude at 688m – taller than Slievemore. How do they measure the height of mountains now? Digitally, via satellite, or…? Hi Achillrocks. Thanks for the reminder. I have only been back on the island for a couple of months so I’d forgot about that. Updated the post. The modern terrain mapping is done using LiDAR which is a plane based system that takes a crazy amount of point data with a laser and calibrates it using GPS data about the planes location. man… i woud love to hike to the top of slievemore. that would be an experience that i would never forget. achillfieldschool on Welcome to our Blog! Slievemore; geology… on Welcome to our Blog!